After Sergey Karjakin finally drew with the white pieces it was down to someone else to save the day against Armenia, and the hero turned out to be Peter Svidler. His analysis is included in this photo report on the 9th round. 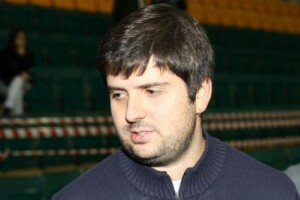 Svidler’s comments on his opening knowledge should be taken with a huge pinch of salt. Despite some disparaging comments by Evgeny Bareev in recent days it’s possible that no-one alive knows the Grünfeld better. As I don’t know the Grünfeld Defence at all I turned for help to the club, and the club’s help wasn’t bad at all. I’d had the position after 22. Ra1 Nb4 at home. I should, of course, have looked at it a little more closely, as I started thinking after 23. Kd2, which isn’t good. But, to be honest, I thought that I couldn’t concentrate on one position as there are so many lines people play in the Grünfeld. 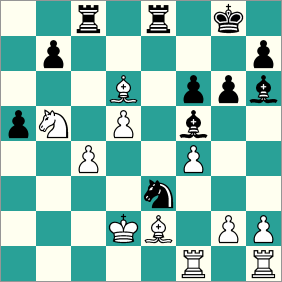 The position’s very unclear and my opponent, it seems, thought he had a huge advantage. And when it turned out that he didn’t have a huge advantage, he somehow managed to ruin his position in three moves – apparently because of the change of scenery. Grischuk: Nothing tragic has yet happened to white. Svidler: I’m not sure I’m better. 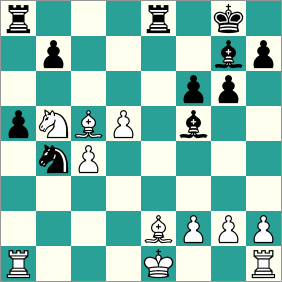 White has such a healthy structure that if he manages to consolidate, even giving up a full exchange with check, then all the same I’d have a very difficult technical task. The fact that I won before the first time control is evidence of one thing: Gabi here wasn’t the same Gabi as he usually is at the Olympiads. I didn’t count on converting my edge so quickly. In general, I thank my older, and to be more precise, younger brothers for enlightening me! 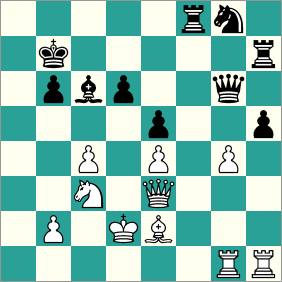 27.Nc7 Nxf1+ 28.Rxf1 Red8 29.Nb5 Bf8 30.Bxf8 Kxf8 31.g4 Bd7 32.Nd6 Rc7 33.f5 gxf5 34.gxf5 b5 35.cxb5 Rc5 36.Bc4 Bxb5 37.Nxb5 Rxc4 38.Kd3 Rc5 39.Nc3 Rdc8 40.Kd4. White resigned. And what happened in the other games? 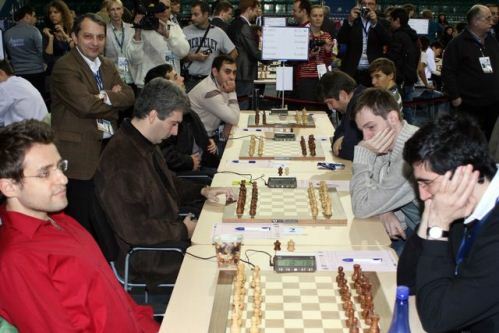 As far as I recall, Volodya (Kramnik) didn’t set himself any particularly ambitious goals. He got a slightly worse endgame and, as expected, held it without any visible concern i.e. purely superficially he didn’t spend more than three seconds solving all his problems. On the fourth board the thematic match “Russian Team v the Berlin” continued; today it ended with a surprising result for us. Sergey plays this line himself as black, and when it was used against him I thought that he might, perhaps, know the hidden magic word. But it turned out that, most likely, there just isn’t any such magic word. Why has that been going so badly for us? We can’t win against it, and we’ve lost with white and black? Well, we still haven’t lost with white. That’s the second team, and I wasn’t talking about them just now. Timofeev simply didn’t want to take a draw, and he didn’t want it so strongly that he crossed the line of acceptable risk. And why isn’t it going right for us? I’m very embarrassed about my game with Almasi as I realised the Berlin was possible and that he played 7 or 8 different Berlins. For some reason I had a black-out: I thought that Bd7 wasn’t played any more precisely because of the line I’d chosen, while it turned about to be a known theoretical draw. As for today’s game, I think the explanation is: the line’s “=”. There are some objective realities it’s difficult to fight with, even for such magicians and wizards as Sergey. Alexander’s game involved a very complex strategic battle, which it’s very difficult to comment on from the sidelines. Apparently he kept everything under control. Perhaps he was never much better, but he controlled the situation and watched what was happening in my game. When my advantage crystallised he calmly removed all the pieces from the board. In that position, no doubt, it wasn’t a decision forced upon him, but why not if we’d win the match? Actually in the game Svidler mentioned above Grischuk did have a chance to land a killer blow. That was the theme of some almost lyrical analysis by Vasily Lebedev (he quotes poetry at least twice – e.g. the mention of gypsies seems to come from a rather loose Russian translation of a line by Kipling!). Below I’ve only included the beginning, while the full analysis is at Crestbook where you can click the moves to see the position on the board. I’d like to entitle the following fragment: “On the advantages of having a good attitude towards bishops”. The main thesis is as follows: don’t keep your long-range pieces in a dark corner; allow them to get out to good positions – and fortune will smile on you. 32…hxg4? But he didn’t lose, although he was only the tiniest fraction of an inch from disaster. While after 33. Bxg4! 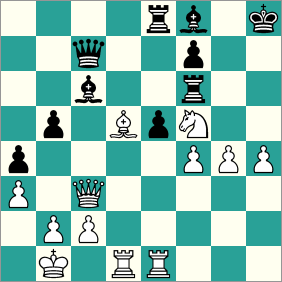 a pile of black pieces on the kingside would fall prey to white. Threatening, as anyone can see, Bc8+! winning the queen. 34. Be6!! Onwards, but not for the gypsies’ nomadic dream, but for the black queen! How can you not only not lose such a position as black, but actually win. It’s just fantastic. I’ve come to the conclusion: in Women’s chess lost positions don’t exist, there’s only a lack of fighting spirit. During your game there was a minor incident with your opponent. Could you tell us what it was about? I offered him a draw when I saw that my teammates had good positions. My opponent, observing the rules, consulted his captain – you can do that once a match. The Hungarian captain told him to decide for himself. But a few minutes later he again asked him for assistance, and moreover Peter Leko, the Hungarian no. 1, came over to him and started to explain something strenuously. You can be forfeited for such things. But the arbiter simply decided to issue a warning. Though chess isn’t football where you’re given a yellow card so you behave more cautiously. Yesterday I forgot to show the reunion of the functionaries. So then, the FIDE Presidential Election is over. 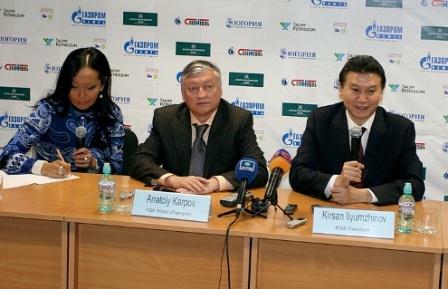 Anatoly Karpov has officially congratulated Kirsan Ilyumzhinov on his re-election. In the photo they’re sitting together. There are no longer any “trails of corruption”, no-one’s destroying chess – quite the contrary: “Kirsan Nikolaevich and I have a full mutual understanding”. On my feelings about this whole election story I can only say one thing: I’m disappointed. EVERYONE (WITHOUT EXCEPTION) showed a side of themselves that it would be better never to show to anybody. We saw it all with our own eyes, smelt it with our own noses, and nothing good came of it. In my opinion, that’s the main conclusion from the election. Svidler on Rd 9: "As I don't know the Grünfeld Defence..."
"Fortune beckoned... then melted into thin air"
Bareev: "Today Ian played like a genius!" "If it comes to an endgame the trainers need Validol"
Kramnik: "99% of the chess world was rooting for Anand"
It’s a bit of an anti-climax :) “Alexander played more solidly/safely”. Steve Giddins, the Editor, British Chess Magazine has a disturbing tale to tell on the FIDE Elections and the “reconciliation” between the rivals, Karpov and Illumzhinov.